Welcome to the Christmas Island Style website. Let this web portal guide you to all the great Christmas Island Style events. From this website you can view our calendar of events (see below) or download and print a one page schedule of all 2018 Christmas Island Style events. If you click on the Photo Galleries tab you will be able to view photos from our wonderful events. We have also provided a page to keep you updated on Christmas Island Style news. The entry forms & flyers page includes registration forms for the Golf Tournament, Street Parade, and Boat Parade event flyers. The About Us tab will provide you with the history of Christmas Island Style. 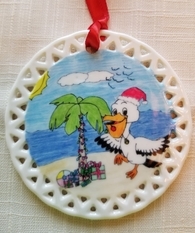 The 2018 Christmas Island Style Ornament are available for $13.00. Click here to view the ornament and info on where to purchase it. Click here to view a list of related links. Please enjoy our website and all the Christmas Island Style events.